In the wake of announcing 5G trials in the US, Samsung has confirmed it will be deploying a 5G fixed wireless trial in London in the second half of 2017. The trial will be conducted alongside communications provider Arqiva and will see an early 5G prototype deployment come to the UK’s capital. Interestingly, Samsung is positioning the trial as a potential replacement for residential and commercial fibre – an ominous sign for BT’s bedraggled Openreach. Fixed wireless does pretty much what it says on the tin. Instead of running fibre or copper wirelines into premises, high capacity radio is used as the principal access medium. High frequency millimetre wave 28 GHz spectrum, coupled with directional beamforming technology, will beam from an external wireless access unit directly into receiving customer premises equipment (CPE) for distribution around the building. Arqiva CEO Simon Beresford-Wylie inferred the company won’t be tempted to move into the spotlight and become a front line 5G operator, insisting Arqiva will continue to play the role of network infrastructure provider and connectivity facilitator to the country’s MNOs. 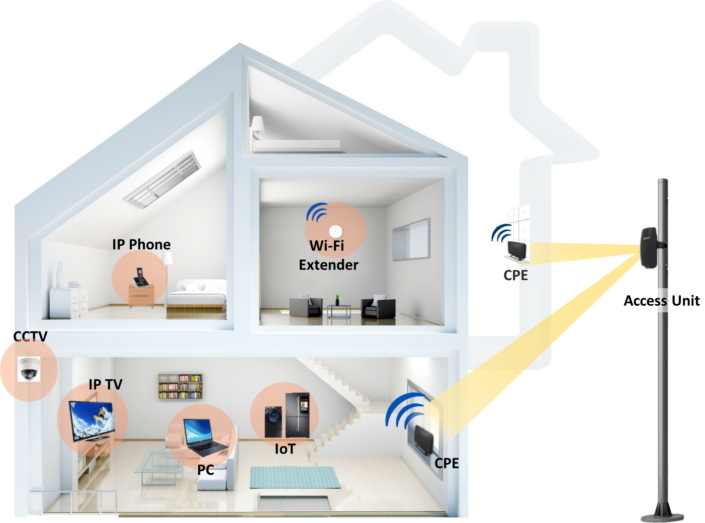 5G fixed wireless presents a very viable, and apparently imminent, alternative to wireline infrastructure and FTTH. Principally, the level of access speeds potentially available could dwarf those of existing wireline networks- clicking into the multi-gigabit region. Sure, FTTH unlocks gigabit speed, but in 2017 FTTH connectivity only sits at around 1 million premises passed – according to the FTTH Council and INCA. If penetration is taken into account, as in the number of active FTTH subscribers, then that represents less than 1% of active internet subs in the UK. There’s definitely room for a more efficient and far-reaching next generation broadband access platform. The reason for this minimal FTTH uptake comes back to a common argument made by BT Openreach in response to criticism of its perceived lack of full fibre investment: the cost of deployment in terms of technology and the civil engineering impact of continually digging up major roads across the country and in well-established cities to lay yet more fibre. 5G as a fixed wireless solution requires fibre connectivity for backhaul, of course, but Samsung’s other 5G trials with Verizon predict a 500 metre wireless access radius per unit. While it remains to be seen how wireless capacity is affected in densely populated urban areas, a half-kilometre connectivity radius per basestation has the potential to serve hundreds of premises in Central London alone. The trial in question will be taking place in London’s West End and home to Arqiva’s UK headquarters. The UK telecoms market, and particularly BT, will be watching with interest, perhaps from the top of the BT tower.